Your Windows 10 laptop is readily able to handle two monitors: the laptop’s own screen and an external monitor. That’s because a monitor connector is a standard feature on all laptops. The reason is so that you can use the external monitor or projector for making presentations. 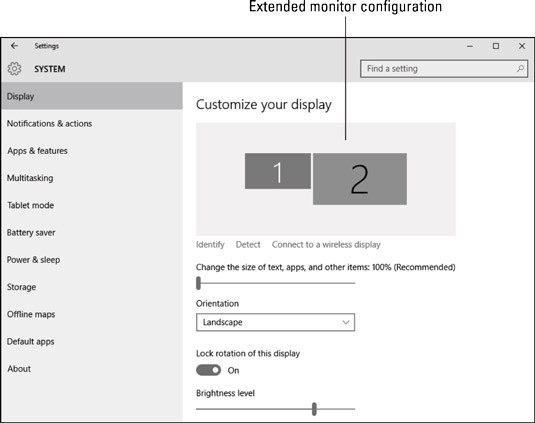 Even if you’re not making a presentation, you can use the monitor connector to add a larger or second monitor to your laptop computer system. To add the external monitor, locate the monitor connector on your laptop’s back or side. Plug in the monitor. Turn on the monitor. 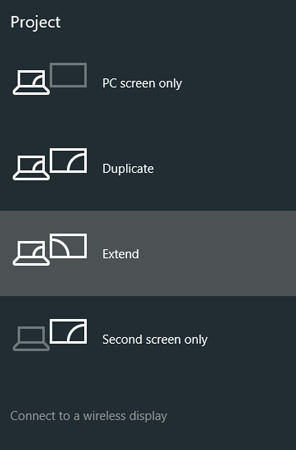 Duplicate These Displays: Also known as the mirroring option, the laptop uses both displays at the same time, showing the same image on each. This option is chosen automatically when you attach an external monitor (or projector) to your laptop. Extend These Displays: Use the second monitor to extend the desktop area, giving you one computer with two monitors. Show Only on 1: Use only the laptop’s display; ignore the external monitor. Show Only on 2: Use only the external monitor. Choose the Display Settings command. You see the Settings app window, which shows the Customize Your Display screen. Choose an option from the Multiple Displays menu. Click the Apply button to temporarily confirm the monitor configuration. Click the Keep Changes button to lock in any changes. And now … the shortcut! Because external monitors can also be projectors, you can use the Win+P keyboard shortcut to quickly configure how the second monitor behaves. Use the Project panel, which slides in from the right side of the screen to quickly choose an external monitor configuration.